A Running Toilet: Is This The Best We Can Do? 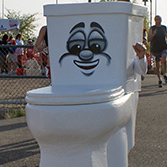 On March 22, some good sport in the water community will once again struggle into a 6-foot-tall toilet costume and lead the One for Water 4-Miler Race around Rio Vista Community Park in Peoria. The photo of the running toilet is re-tweeted more than any water conservation event in the Greater Phoenix Metropolitan Area. It must cross people’s minds: Is a silly pun the best a desert metropolis can do to save its precious water supply? The answer is no, but it is one way to let people know about how cities can help homeowners and businesses conserve water. Saving water is so important to the Phoenix Metro’s desert cities that many are willing to pay homeowners to replace old plumbing with more efficient fixtures or change grassy yards into desert gardens that need much less water. These cities also will guide you in the step-by-step process of planting and caring for a lovely water-saving garden through free classes, videos and brochures. Goodyear has a new competition that will give a year’s worth of free water to the household that plants the best new desert garden. Many cities, including Scottsdale, Avondale, Peoria, Gilbert, and Glendale, offer free water-leak detection kits for homes and businesses. Chandler will send a water expert to audit your home for potential leaks. Cities offer water-saving educational videos and school curriculum for teachers. All the AMWUA member conservation offices can provide copies of the Smart Home Water Guide, a step-by-step resource to finding leaks inside and outside your home. The running toilet, Leaky Loo McFlapper, is an effort to make people stop, laugh, and learn to make their own water-saving contributions. According to the U.S. Environmental Protection Agency, the average home loses 10,000 gallons of water a year through leaks. That’s enough water to do about 10 months worth of laundry. Toilets are a home’s most likely water loser, then faucets, including shower heads, grass sprinklers, underground drip irrigation systems, and undetected leaks in backyard pools. The running toilet is a reminder during Fix A Leak Week, March 17-24, to investigate the water that seems to always puddle around one irrigation head (Yes, the race also includes a giant running sprinkler head) or to fix the faucet drip that irritates everyone in the family but you. They are usually small and simple fixes. There will be plenty of people at the March 22 Family Fun Festival during and after the run to show you how. The festival also includes food booths and music. So is a silly pun the best way to save water in the desert? Maybe not, but its message could make a serious contribution. Find more information at amwua.org. It's hard to miss the smiling toilet on the homepage.